Speakers should always be placed forward of the stage or performance area, pointing away from performers and towards the audience. You may often see loudspeakers arrayed as in the diagram below, at either side of the stage, pointing straight forward. The blue shaded area shows the area covered by speakers with a 90° HF dispersion (-6dB limits): a relatively common pattern. There is quite a large area immediately in front of the stage without adequate HF cover. 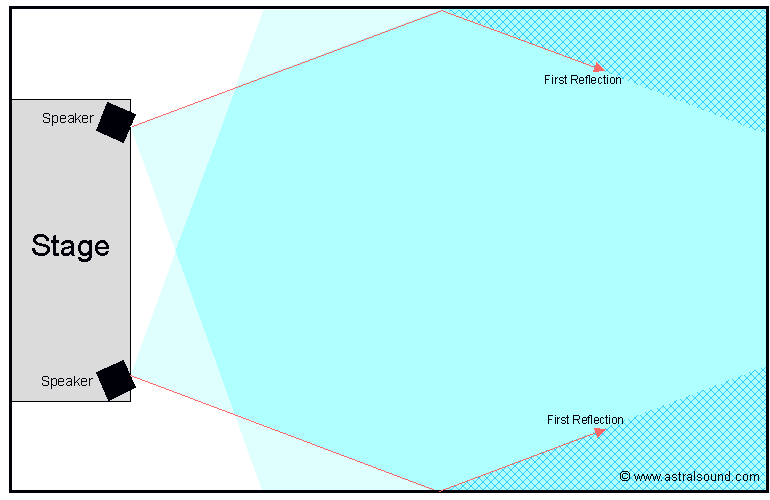 Direct reflection from the nearest side wall affects more than half the listening area (the patterned area on the diagram). This increases the overall level of reflected sound, adding unwanted colouration and reducing intelligibility. There is a substantial area in front of the speakers where their cover does not overlap. Effectively this means only one speaker will be heard in quite a large part of the listening area. For some listeners this will distract attention from the performance by giving the impression that the sound is coming from the loudspeaker, rather than from the performer. Also, any stereophonic effects - e.g. reverb, which is most important for listeners at the front of the auditorium (where the loss of stereo cover is greatest) - will suffer. By angling the speakers inwards slightly, the disadvantageous effects are greatly reduced. In the diagram below, the same speakers are angled inwards by 25°. The ‘hole’ at the front is much smaller. 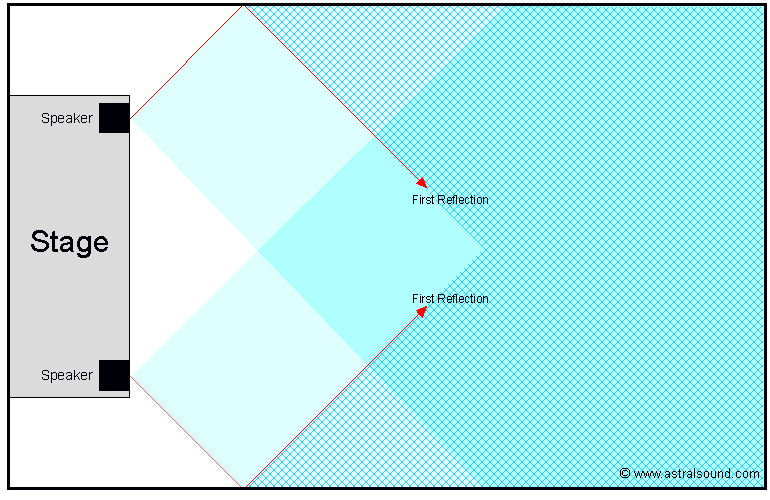 The area affected by direct reflection is much reduced, and the distance from speaker to earliest reflection is much greater (reducing the overall level of room reverberation, as well as minimising the number of listeners likely to be affected). Most of the auditorium gets effective cover from both speakers. Note, also, that in off-centre listening positions an audience member would be on-axis to the further speaker, and off-axis to the nearer one. This means that each is similar in level in most listening positions (where, in the first diagram, the nearer speaker would be louder). In real life the cut-off isn't as abrupt as the diagrams suggest, but the overall effect is still quite noticeable. The optimum angle obviously depends on the size and shape of the room, as well as the response pattern of the speakers used (the inward angle should not be so great that forward microphones fall within the area the speakers are designed to cover). However, some inward angle will almost always be advantageous. This helps with our aim to keep reflected sound to a minimum. The ‘hole in the middle’ effect is a bigger problem. The reflection point on the nearer side walls gets closer. Greater inward angle is needed (potentially bringing the microphones within the angle of cover). The speakers may have to be placed offstage. This may make it harder to raise them far enough to achieve optimum vertical placement.